Hoopla is an award winning Software-as-a-Service (SaaS) provider that uses data analytics and game mechanics to bring fun into the workplace. Hoopla’s gamification platform is built on motivational psychology and helps managers engage employees, boost productivity, and drive business results. Hoopla uses rewards for motivation but also uses custom features to keep employees focused on company goals. Hoopla uses the power of competition to inspire motivation. Customers can create contests focused around business objectives and allow employees to interact in a game-like environment. 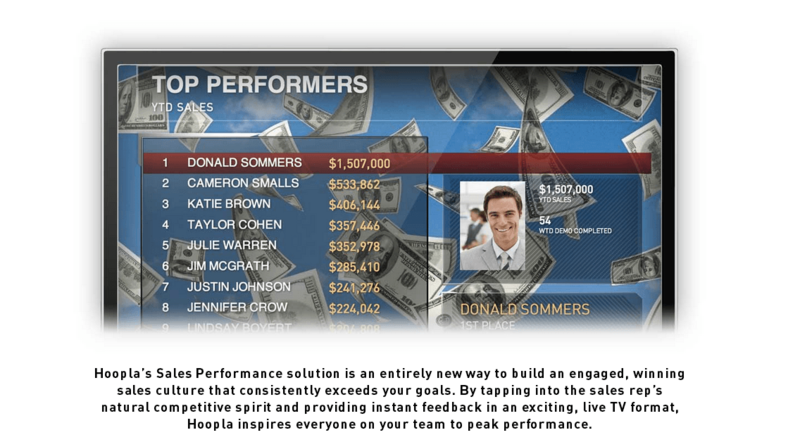 Hoopla uses Hoopla TV to showcase performers, get real-time feedback, and track individual or team progress. Real-time alerts track key performance metrics and deliver notifications faster than email. To measure outcomes, Hoopla uses data-driven results that can be seamlessly integrated into a CRM or other business software. Accurate reporting provides measurable results that can be used to identify motivating factors and develop better employee incentive programs. By continually refining their incentives, companies can boost productivity, forecast future sales, and improve their internal workflow. One Hoopla customer who has experienced great sales growth has been the cloud-based webcasting and virtual communication company ON24. Since implementing Hoopla’s gamification platform, the company’s lead generation and sales pipeline has grown by 200 percent. ON24 uses the data provided by Hoopla’s analytics to find out what motivates their most successful salespeople. ON24 intends to use this data in the future to create custom training programs for their entire company. See more choices of gamification software in our Gamification SmartAdvisor. Learn everything you need to know about Hoopla. Our experts will reach out to you shortly.